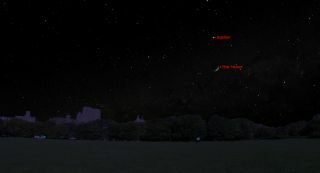 This sky map shows the location of Jupiter near the moon on Saturday, May 3, 2014, as seen in the western sky at 10 p.m. local time from mid-northern latitudes. Stargazers have a chance to see Jupiter dazzle in the western sky this weekend, weather permitting. About an hour after sunset on Saturday (May 2), approximately one-third of the way up from the horizon to the overhead point, you'll see an eye-catching sight: a thin crescent moon against the darkening sky. Hovering 8 to 9 degrees almost directly above this slender lunar sliver will be Jupiter, dazzling like a silvery white "star." To judge how far apart Jupiter and the moon will appear in the sky, note that your clenched fist, correctly held, will measure 10 of those degrees. In this case, the pair won't appear particularly close together — roughly a fist apart. This sky map shows the location of Jupiter near the moon on Sunday, May 4, 2014, as seen in the western sky at 10 p.m. local time from mid-northern latitudes. On Sunday (May 4), as darkness falls, look westward to see a somewhat wider crescent moon. Jupiter will appear about 8 degrees to its right. Both the moon and Jupiter will set at around 12:45 a.m. your local time. This is the last month (until September) in which the solar system's biggest planet will be high enough in a dark sky to permit crisp telescopic views of its cloud patterns and four big satellites. Jupiter is still the brightest celestial object in the evening sky and the first to come out each night at dusk. It still outshines the brightest true stars. In fact, it rivals Sirius — the brightest star in the sky — which, in the early evening, sparkles low in the southwest sky. Note how Jupiter shines with serene steadiness, while Sirius twinkles vigorously, as if struggling to match Jupiter's glory. But during May, Jupiter will slowly slip farther down into the glow of evening twilight in the west-northwest sky. And by mid-June, it will be setting right around the time evening twilight ends. This month, Jupiter is falling far behind Earth in the never-ending planetary race around the sun, and it continues to move slowly eastward among the stars. Currently, Jupiter can be found in the middle of Gemini the Twins, forming a triangle with Gemini's two brightest stars, Pollux and Castor. Because it takes nearly 12 Earth years to orbit the sun, Jupiter spends about one Earth year in each of the 12 zodiacal constellations. Jupiter moved into Gemini in late June 2013 and will exit Gemini and move into Cancer the Crab in early July. Editor's note: If you have an amazing picture of the moon, Jupiter or any other night sky view that you'd like to share for a possible story or image gallery, send photos, comments and your name and location to managing editor Tariq Malik at spacephotos@space.com.